A macho-man in need of legal assistance on a budget turns turns to the Law Office of Pony & Pony, Ponies at Law to represent him in the case of his life! Leaving his case squarely in the hooves of pony attorneys Tristan and Pascal, the two puppet attorneys struggle to help Juan find his legal solution while getting to the bottom of their own personal problems. Elizabeth Lash interview on her program "Entering the Bar" of Ponies at Law creator, Cara Parmigiani about how it all began and the real life behind-the-scenes law practice. Cool stuff! Click here! 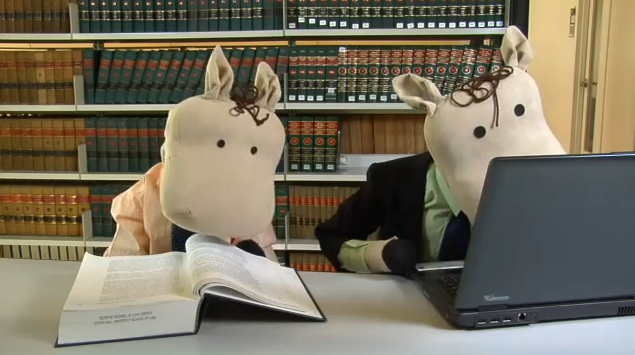 Follow a pair of brother-pony-attorneys Tristan and Pascal, as they solve people's REAL legal problems (with the help of licensed professionals)! Silly, witty and [gasp!] educational... Answers questions like, "What are the differences between Civil and Criminal Charges," "What is a Patent"... Check out all 39 exciting episodes! Contact us as we make getting credit for continuing legal education fun. Previously we lectured at the New Jersey State Bar Association (NJSBA) Annual Meeting 2016, "I speak Lawyer." We look forward to participating in your next event.